Samsung all but confirmed that February 25th announcement of the Galaxy S9, as it used the name in an official presser statement, and said to expect "upcoming release of the Galaxy flagship, which will launch next month." By launch here it most likely mean the unveiling presentation that it will hold the last Sunday of February, for which it already sent us invitations, rather than the actual release date, which all indications show will be in mid-March. 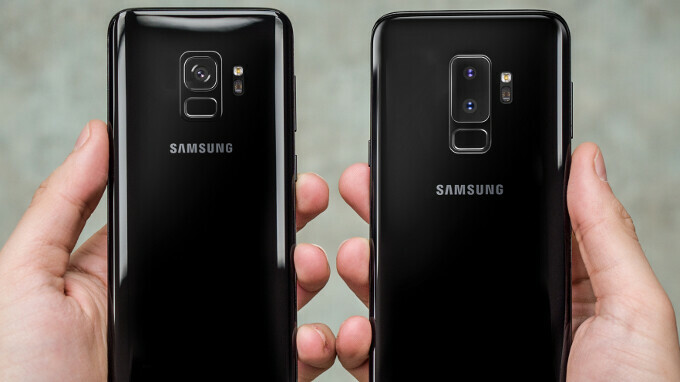 The official confirmation of the Galaxy S9 naming scheme was dropped as a casual forecast for increase in Q1 sales, tucked in the beginning of its annual financial results and strategy press release, in which it boasted record 2017 profit. "In the first quarter, the company expects the mobile business to improve its earnings, led by an increase in sales of flagship products with the launch of Galaxy S9," chirps Samsung there, not even trying to hide what it has up its sleeve for us this spring season. In addition, it tips that the new crop of high-end handsets coming our way will have "differentiating core features and services, such as the camera and Bixby," perhaps referring to the expected new variable aperture camera kit on the S9 and S9+. These won't be the only "Camera. Reimagined" upgrades it has prepped for us, though, as a leaked Galaxy S9 box hints at Super slow-mo, while the S9+ is expected to be the first handset in the premium Galaxy S lineup with a dual camera. We can't wait. dang, i thought it won't be a Galaxy, never thought of that. Git out with that Bixby nonsense. Different use cases but I do agree, Bixby does on device much better than anyone else but if I want off device info, I don't think anyone is better than GA right now. Rumor has it that Samsung is eliminating to reactivate via Hi Bixby for any subsequent requests which will make it far more conversational. Agreed. Once Bixby becomes as vast as Google ai is with off device info which it's getting close it will game over for Siri and Google ai..
Yeah Game Over for Google who is five years ahead in AI race. You really should read a bit, about their AI efforts. Also the sheer amount of data they have at their disposal to train AI and make it better is unprecedented. They have services that are used by over billion people. All that data is at the disposal for AI. They have a company that made and AI that beat the best Go players in the world. And you really think they will not use all that knowledge to make GA better. And how is Samsung supposed to beat that ? You’ve obviously never used Siri or Googles AI, otherwise you wouldn’t have made such a stupid and untrue statement. You haven’t “tested this thoroughly” otherwise you wouldn’t have made such an untrue and stupid comment about Bixby being both better than Siri and Google AI’s. You’re just a troll, and not a very good one at that. Fine, post a video of controlling the Apple Music app on your Note 8 using Bixby. Tell Bixby to open the Apple and play a song, chose whatever song you’d like. Here let me translate what you wrote; “Bixby can’t control the Apple Music App, but instead of admitting that, I’ll deflect.” Bixby can’t even reliably set location based reminders, just an FYI, something both Siri and Google take in stride. Now stop trying to be “that guy” meaning a purposely contrary idiot. Bixby is annoying. Tried to send multiple text and it kept giving me issues. I wish that bixby button could be re-configured for alexa or GA. Bet you have never used it have you. I love using Bixby, it's always right on with what ever I use it for. Apart from the improvements in canera i dont find anything intersting in the new s9 over s8 as of now. But we never know if samsung will surprise us. I always wonder why people are so desperate for updates. Samsung has most features built in irrespective of the Android Version. They send out security updates every month. So why the whole Android version update negativity ? Sadly they don't send out security patches every month. They are doing much better , I have gotten one every month for a while now. They do run a month behind. I just got January's yesterday. I personally couldnt care less about Android os updates as there is rarely a noticeable change. Security updates I am getting less concerned about as I have never heard of actual users of these devices being affected by any of these security issues. Just probabilities. Not the best for photos Not best for record videos Not best to listen to music Not fastest Not fast updates Not best battery life Not most resistent No phone is perfect, but s8 is miles from being. I really don't like the narrow feeling of the original S8 but if the camera is the real deal and stereo speakers are included, I think I can deal with that one gripe for everything else it offers. S9 and the S9+ should be super refined versions of the amazing S8 and S8+. Is Bixby still around? I hope they keep the option to remap the bixby button, or remove it altogether.